Fashion in Indonesia was thrust into the spotlight in Indonesia Fashion Week (IFW) 2015, and it gained significant attention both from local and international fashion lovers. In addition to having fashion shows, bazaars, and talk shows, IFW 2015 also held a fashion design competition to encourage young designers to show their works of fashion. Out of 350 contestants, only 10 of them qualified to compete in the Dulux-sponsored event. One name that attracted attention at this year’s competition is Avridya Keumala, a runner up in the competition. 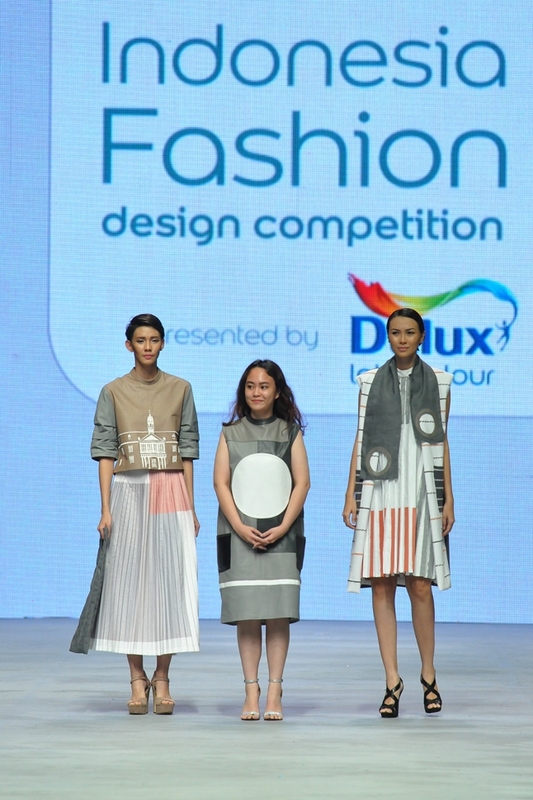 An alumnus of BINUS NORTHUMBRIA SCHOOL OF DESIGN (BNSD), Avridya’s collection ‘Constru(e)ct’ was praised by the judges at the competition. “We had a bit of problem in choosing the best. Out of the 600 contestants, 300 sent along their portfolios. Then, from 300 it became 30, then it finally became the top 10,” said Taruna K. Kusmayadi., chief judge of IFW 2015. At this year’s competition, the organizers applied Dulux’s color of the year ‘copper orange’ as its theme. “Constru(e)ct” is a concept introduced by Avridya based on Indonesian museums. She said that at this year’s competition she was inspired by the structure of Fatahillah Museum in north Jakarta. “I think that the structure of Fatahillah Museum really represents the structure of museums in general. Moreover, the building is quite unique and iconic. Fatahillah Museum is a Jakarta icon. Not to mention the high historical values of the museum. The building was once used as the country’s center of administration,” said Avridya. Avridya hopes that by using this concept it will improve the youth’s concern for Indonesian history. “The moment is just right. Many of my friends have been visiting museums,” added Avridya. For the competition, Avridya combined her concept with fashion design techniques that she has mastered. The techniques and materials that she used were considered unique and garnered a lot of attention. With her skills, Avridya could finish her work in only three weeks. This is fast for fashion pieces that used many techniques and rare materials. The biggest challenge that Avridya had during the working process of the fashion pieces was in managing the people that were aiding her. Although she did not recruit many people in her team, Avridya felt that managerial skills were important in running a team. “I have to be able to organize my team’s working time. With not much time left, it took a special skill to unite my team members,” she said. For now, Avridya will concentrate to continue her study at Koefia. Other than that, she is also preparing to join a few fashion events that will be held next year.